"Numeracy is an essential skill for students in becoming successful learners at school and in life beyond school, and in preparing them for their future roles as family, community and workforce members. More broadly, a numerate population is critical in ensuring the nation’s ongoing prosperity, productivity and workforce participation." An Educational Puzzle challenging you to correctly complete all the equations using all the numbers on both sides of the 49 tiles. Can you do it in under 5 minutes ? You are some Genius if you can !! Playing Sum Genius is an ideal Classroom activity in groups as it helps to develop numeracy skills, communication and team building. The task you have is to utilise the 49 tiles to correctly complete the 7 equations. You can swap and flip the tiles to reveal other numbers that should help you to your goal. The tiles have numbers on both sides so you can FLIP them to have a greater choice of numbers. Interested to buy the Sum Genius puzzle ? Rotate the circle to line up a number in it that will add up with the number in the descending disc to give the answer in the middle. Top Scores are shown on the Leader board. Points are awarded for different speeds. 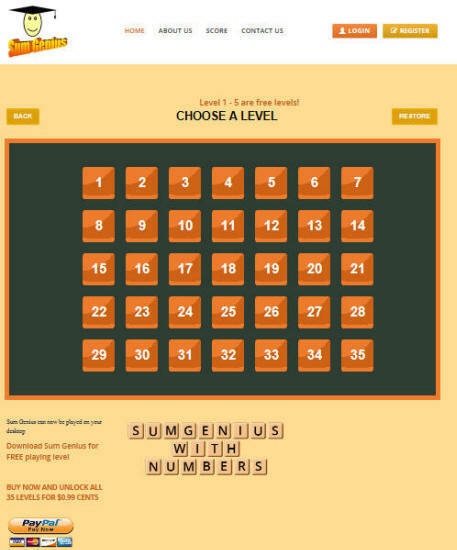 Welcome to the Desktop online version of Sum Genius...	a numeracy development game. An education puzzle that helps develop numeracy skills. "In the	Australian Curriculum, students become numerate as they develop the knowledge and skills to use mathematics confidently across other learning areas at school and in their lives more broadly. Numeracy involves students in recognising and understanding the role of mathematics in the world and having the dispositions and capacities to use mathematical knowledge and skills purposefully."